Stone, with his self-professed political dirty tricks and the tattoo of Richard Nixon on his back, has long lurked in the shadows of Donald Trump’s world and was instrumental in guiding him on his first steps to the White House. Stone was only officially on the president’s campaign for a few months, but would spin reporters, peddle conspiracies and, according to prosecutors, collaborate with WikiLeaks to release damaging information about Hillary Clinton in the final stretch of the 2016 campaign. He was arrested Friday for lying to investigators and trying to tamper with a witness. Stone has a knack for commanding attention: He sports impeccably tailored suits and close-cropped bleach blond hair and is willing to say just about anything. He has known Trump for decades, pushing him to run for president as far back as 1998 after seeing in the New York celebrity developer the potent political combination of charisma, money and controversy. 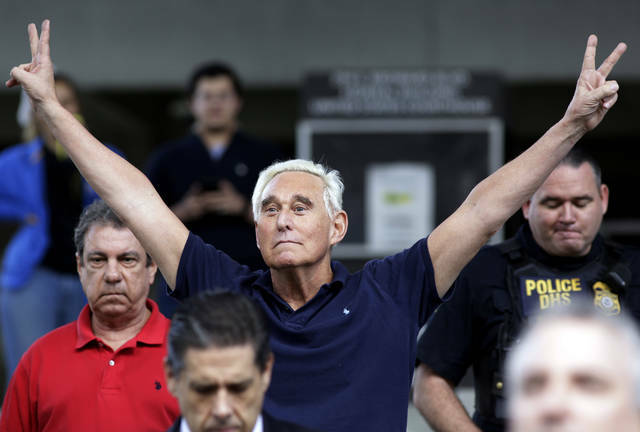 Stone on Friday denied any wrongdoing, flashing Nixon’s famous “victory” sign as he stood outside a Florida courthouse hours after he was arrested by FBI agents who moved on his house before dawn. He decried his arrest as motivated by the president’s political enemies and as an example of overreach by special counsel Robert Mueller, who is investigating 2016 election interference and possible ties between the Trump campaign and Russia. “There is no circumstance whatsoever under which I will bear false witness against the president nor will I make up lies to ease the pressure on myself,” Stone said after being released. Stone had predicted his own arrest for months, trying to raise money for his defense online while making sure to stay in Trump’s good graces, perhaps with an eye on a presidential pardon down the road. Having long lived by the code that “It’s better to be infamous than never famous at all,” Stone almost seemed to beam outside the Ft. Lauderdale courthouse. Sam Nunberg, a Stone ally who also worked on the early stages of the Trump campaign, said the self-described “dirty trickster” would relish the legal spotlight. The 66-year-old political operative, the subject of the Netflix documentary “Get Me Roger Stone” released two years ago, has been working on Republican politicians’ campaigns for nearly five decades. He practiced what he deemed the “dark arts” for Nixon’s 1972 campaign, installing a spy in Hubert Humphrey’s campaign and later taking a job in the administration. He has said he was not involved in Watergate and immortalized his love for the 37th president with the smiling Nixon tattoo on his back. He then worked on campaigns for Ronald Reagan, where he met a fellow operative by the name of Paul Manafort. The two men, along with partner Charlie Black, founded a business that soon became one of Washington’s mega-lobbying firms. The group became known for its effectives in helping Republican causes and willingness to take on unsavory clients, such as dictators Mobutu Sese Seko in the Republic of the Congo and Ferdinand Marcos in the Philippines. Manafort later became Trump’s campaign chairman in spring 2016, in part due to a recommendation from Stone. Manafort was found guilty last year on a series of financial crimes. For decades, Stone kept turning up in the center of political controversies. In his own telling, he was at the center of an unruly demonstration during the 2000 presidential recount in Florida that pressured officials to halt the tally and helped give the White House to Republican George W. Bush. He also claimed to have a hand in uncovering a prostitution scandal that helped bring down New York Gov. Eliot Spitzer in 2008. Through it all, Stone never strayed too far from Trump’s orbit. When Trump began toying with declaring a White House bid in 2015, Stone was there, helping create the catchphrase “Build the wall” as shorthand for the celebrity businessman’s commitment to hardline immigration policies. Stone left the campaign just a few months later — he said he quit, Trump said he was fired — but stayed close, frequently holding late-night phone calls with the candidate to discuss strategy and messaging. He got banned from cable news channels for threatening a host, was accused of peddling false stories about Sen. Ted Cruz to the tabloids and cultivated support for Trump among the fringes of the conservative online movement, including Alex Jones’ InfoWars. And he created the impression within the upper levels of the Trump campaign that he had contacts with WikiLeaks, the shadowy organization devoted to revealing secret documents, which had obtained tens of thousands of emails from Clinton’s campaign. The indictment against Stone, citing details in emails and other forms of communications, suggested that Trump’s campaign knew about additional stolen emails before they were released and asked Stone to find out about them. The first batch of stolen Democratic National Committee emails were released on July 22, 2016, five days before Trump, at a campaign event, called for Russia to unveil the rest of the Clinton team’s emails. That August, Stone tweeted that Clinton’s campaign manager, John Podesta, would soon have “time in a barrel,” suspiciously predicting trouble for him a full five weeks before Wikileaks released a batch of his emails. Those Podesta messages, which turned into a damaging story for the Clinton campaign, were released that October 7th, just hours after a 2005 video of Trump bragging about groping women was unearthed. Stone, who had said publicly that he was in contact with WikiLeaks, has denied having prior knowledge about the release. The seven-count indictment, the first criminal case in months in special counsel Robert Mueller’s investigation, provides the most detail to date about how Trump campaign associates in the summer of 2016 actively sought the disclosure of emails the U.S. says were hacked by Russia and then provided to the anti-secrecy website WikiLeaks. It alleges that an unidentified senior Trump campaign official was “directed” to keep in contact with Stone about when stolen emails relating to Clinton might be disclosed. Judge Amy Berman Jackson said Friday she would provide a redacted transcript as soon as possible. The Feb. 4 hearing will be closed. Manafort pleaded guilty to two counts of conspiracy in Washington in September as part of a plea deal. He agreed to cooperate in the special counsel’s Russia investigation but prosecutors charge he breached the deal by lying. Manafort’s attorneys say he just didn’t have a perfect recollection of all the facts.